One form of renewable energy that is currently causing a lot of excitement is ocean wave energy. The ocean holds a lot of potential for generating energy. The tides and the constant movement of the waves offers an important energy source that is ready to be harnessed. Unlike other energy sources, the seas and oceans of the world could generate an energy that is completely renewable. The consistent movement of the sea would also ensure that energies that were generated from seas and oceans would be reliable and not reliant on favorable conditions. Although energy that is generated from the sea and oceans is an exciting and realistic prospect, it is also relatively new. The opportunities for development are only now being explored and investigated in more depth. The world's first multi unit ocean wave energy farm was opened in 2007 and is situated off the Atlantic coastline of northern Portugal. The substation is situated at the Portuguese town Aguçadoura. The wave farm that has been built in the Portuguese waters uses a system called Pelemis which is Latin for sea snake. The long thin units have been given this name as they are reported to look like giant sea snakes that lie close to the surface of the water. The waves are channeled down the long tubes to generate energy. Portugal is a key exponent of renewable energy. The country has no natural gas or oil, meaning that finding alternative sources of energy is important. The target for renewable energy used within Portugal is 45 percent by the year 2010. Other ocean wave energy farms have been announced, these include two more in Europe, in Scotland and Cornwall,. in the southwest of England, and one in the United States. 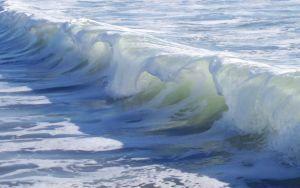 The ocean wave energy farm in America will be sited off the North Californian coast. The Wave Dragon is a pioneering large scale ocean energy solution for bulk electricity generation off the coast of Denmark. Wave Star Energy have been testing an ocean wave energy generating system off the coast of Denmark. The model that is being used is one tenth of the actual size and is scalable. Scientific Applications and Research Associates (SARA) are pioneering a system of harnessing the power of waves using the company's patented magnetohydrodynamics (MHD) generator.